Oklahoma Needs Assessment Report Now Available! Historic April 27, 2011 Tornado Outbreak Affects Much of the U.S.
Drought Conditions Continue to Deteriorate Across the South Central U.S. Welcome to the Southern Climate Monitor! Winter Outlook for the Southern US: What’s in store? So far in 2011, more than 1.4 million acres have burned in Texas. Some 800 fires have occurred throughout the state, burning 401 structures and costing two firefighters their lives. Why is fire activity so extreme in Texas this year? This image, made with data collected by the Moderate Resolution Imaging Spectroradiometer (MODIS) on NASA’s Terra satellite, reveals high temperatures that contributed to hazardous fire conditions. Fire needs dry fuel to burn, and weather conditions in March and April turned Texas into a tinderbox. The state began the winter dry season with abundant vegetation, following a moist spring in 2010. But then drought settled over the state in late 2010 and early 2011, culminating in the driest March on record. Many areas received less than 5 percent of their normal rainfall, according to the state climatologist. In addition to being dry, March and April were warmer than normal. The top image shows ground temperatures for April 7 to April 14 compared to long-term average for the week. 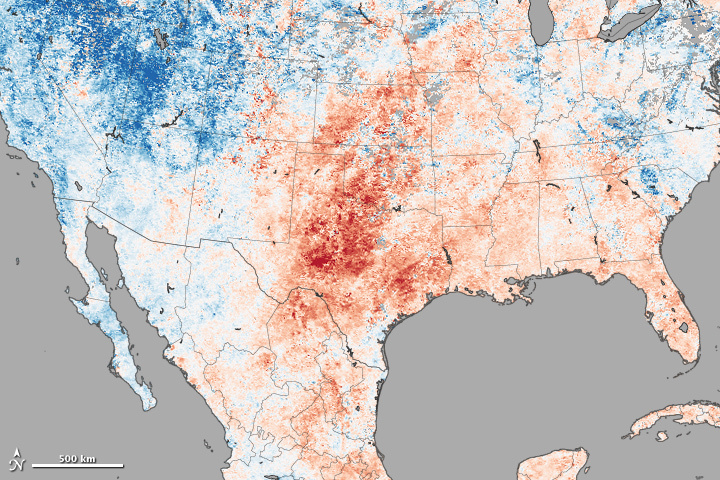 The red tones indicate that most of Texas was much warmer than average, further drying out the abundant grasses, shrubs, and trees already suffering from a lack of rain. The warm temperatures and dry vegetation combined with high winds and low humidity to create extremely dangerous fire conditions in Texas. Indeed, the MODIS true color image on April 15 showed strong winds blowing long plumes of smoke from multiple fires across the state. - National Climate Data Center. (2011, March). State of the climate, national overview. National Oceanic and Atmospheric Administration. Accessed April 21, 2011. - Office of the Texas State Climatologist. (2011, March). Texas Climatic Bulletin, March 2011. Accessed April 21, 2011. - Texas Forest Service. (2011, April 21). Texas Forest Service incident management situation report. Accessed April 21, 2011. - U.S. Drought Monitor. (2011, April 19). U.S. Drought Monitor South. Accessed April 21, 2011. NASA Earth Observatory image by Jesse Allen, using data provided by the MODIS science team. Caption by Holli Riebeek.